About 15 years ago when my dad was working for a mid-size company in Atlanta, he had an experience I will never forget. And although it will sound like an urban legend -- something too clichéd to believe -- I assure you that it happened and that he witnessed it firsthand. It's my favorite holiday story of all time. 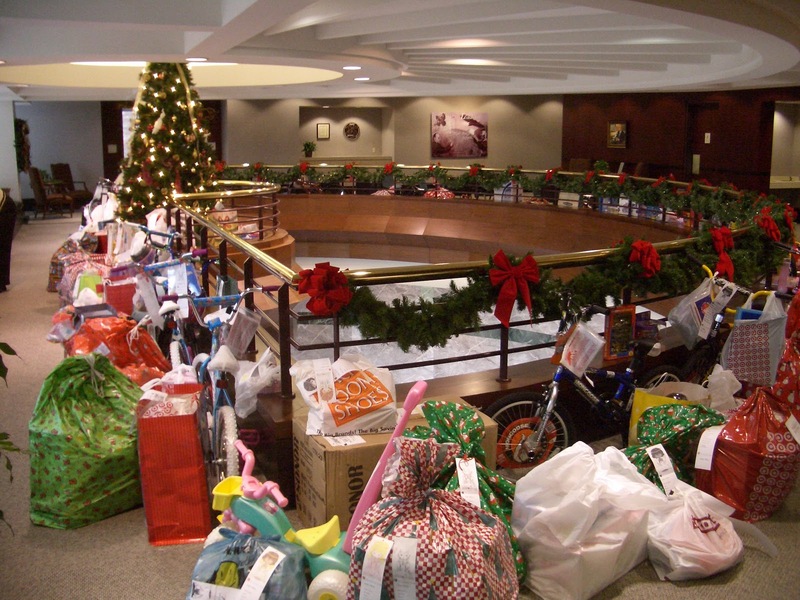 Dad's company participated in the Salvation Army's Angel Tree program every year. The large Christmas tree in their lobby was filled with Angels, and the employees eagerly grabbed them at the first opportunity. That year was no exception. All of the Angels had been "adopted," and the hallway was literally overflowing with bags of new, unwrapped gifts labeled with each child's name. My dad had an international guest that December who was unfamiliar with the program. Seeing all of the unwrapped gifts under the tree, he asked why they were there. My dad explained how the Angel Tree works, and the man said, "I'd love to participate. Is it too late?" My dad answered that all of the Angels had been taken care of and that the truck was coming to pick up the gifts that afternoon -- but that he was absolutely sure that if the man wanted to buy something, they could put it under the tree and it would go to another Angel whose needs might not have been met. That afternoon, the man made a trip across the street to the mall, carefully weighing the toy options at hand. Ultimately, he chose something he knew his own 8-year-old daughter would like … a pink bicycle with a basket on the front. He toted it back to the office and pulled up just as the truck was loading the toys and preparing to depart. Dad helped him get the bike secured, and they headed back into the building, the man flush with pleasure. As they walked by the tree, now empty of gifts, my dad noticed a lone Angel that had fallen off the tree at some point and been covered up by gifts. Unfortunately, nothing was purchased for the Angel since it hadn't been seen. Wordlessly, my dad passed it over to his guest. It was for an 8-year-old girl, and the Needs she'd listed were fairly standard … a winter coat, socks, pants. But she had listed only one Want, a pink bicycle with a basket. And as his eyes rested on the top of the Angel, they filled up with tears … her name was Faith. i love this! i posted it to my facebook wall--- that is the magic of Christmas!!! Wow! Such a wonderful story! Love it! When we listen and act, we are sure to hear God every time. I just finished packing up all of the gifts (for pick up) in our office for the family we adopted. It does my heart such good to see the generosity of those I work with everyday! This story is the icing on the cake. Thank you for sharing. Cold chills, cold chills, and more cold chills! I love this story. Oh wow. These kinds of stories leave me speachless. I have to share this one. Oh WOW! That is so beautiful! I just love how God LOVES to meet the desires of His childrens heart. I wonder who was more blessed that Christmas ... the little girl or the man who acted in obedience to God's heart prompting. Such an amazing testimony. Chillbumps. Thanks for sharing that story. I've had a couple of encounters over the past year that have made me stop in my tracks. I know that God has put that person in my path to remind me that I could be of value. truley amazing! We did our angels at school today and it is such a wonderful feeling helping others in need! Oh my goodness, what a wonderful story. How touching! Thanks for sharing. How sweet. Angels do exist - I believe this with all my heart! Thanks, all for the kind words about this story! It's been my favorite ever since it occurred. Proof that angels are everywhere, and the angels can be US if we open our eyes to the possibilities and our hearts to the Lord! What a beautiful story Katherine! THANK YOU! Tears, tears, and more tears. Thank you for sharing. Wow. That is absolutely amazing!!! What a perfect Christmas story!!! awesome story and many goosebumps, thanks for sharing!